The Jewish community of Suriname is one of the oldest in the Americas, as the first Jews settled in the area around 1500. Today, the Jewish community of Suriname numbers around 200. The Jewish community of Suriname is one of the oldest in the Americas. During the Inquisition in Portugal and Spain around 1500, many Jews fled to Holland and the Dutch colonies to escape torture and condemnation to the stake. Those who were converted to the Catholic fate were called "Marranos." The stadtholder of the King of Portugal gave those who wanted to depart some time to settle their business and supplied them with 16 ships and safe-conduct to leave for Holland. The most prominent amongst them were Rabbi Izak Aboab and members of the Nassi, the Meza and the Pereira families. Many of the Jews who went to Holland departed later for the Dutch colonies because of the climate and problems with their co-religionists in Amsterdam (See Wanderings by Chaim Potok). Many took the opportunity offered by the Dutch government to immigrate to Brazil free of charge or for a small fee. For some time they found in Recife a new home, being merchants or sugar cane growers. After 1643, in Recife, however, everything began to change in trade and commerce; creditors started to seek repayment, and many debtors went into hiding or departed. This fact and the recapture of Dutch Brazil by the Portuguese forced many Jews to leave Brazil for other Dutch colonies in North America and the Guyanas. Jews apparently arrived from Brazil (or Holland) and settled in Suriname as early as 1639, and there is an extant ketubbah, marriage contract, signed by a rabbi in 1643. A second group of Jewish settlers arrived from England in 1652 under the auspices of Lord Willoughby of Parham, who managed to establish a permanent settlement. The next group of Jewish settlers was led by Joseph Nunez de Fonseca, also known as David Nassi, and was of primary importance to this oldest Jewish community in the Western Hemisphere. Most of the group was composed of Jews who had fled the Inquisition and had gone to live under the Dutch in Brazil. When they were driven from Brazil after the Dutch were defeated by the Portuguese in 1654, they went back either to Holland or to Cayenne, Essequibo, and other places in the New World, some finally settling in Surinam in 1666. Experienced traders and agriculturists, they set up many sugarcane plantations, which were a valuable asset to the British colony. In 1652, Lord Willoughby had already brought a group of English settlers to Suriname, some of them probably Ashkenazi Jews. The first Jews in Suriname lived among the other Dutch and English settlers in Thorarica, then the capital of Suriname. Remnants of a cemetery and a synagogue were found there capital in the beginning of the 18th century. When the Jewish population increased they moved to Cassipora, some miles upstream. Here, they established a cemetery on a hill close to the banks of the Suriname river. After some years they settled at Jodensavanne, a mile from Cassipora, also along the Suriname river. In the beginning, they were called "Congregation of Cayenne." According to their archives, the "Portuguese Jewish Congregation of Suriname" was founded in 1661/1662. When Suriname was English territory, the Jews received important privileges from the Crown on August 17, 1665. These were re-affirmed by the Dutch, after Suriname was taken by Abraham Crijnssen in 1667. From 1665 to 1667, the first synagogue was built on the land of Baruch da Costa and Selomoch (de) Solis at Jodensavanne. The Kahal Kadosh (Holy Congregation) was called Beracha Ve Salom (Blessing and Peace). The K.K.B.V.S. was a "filiacao" of the Congregation of Amsterdam and followed the same rituals. The "College of Senhores do Mahamad" consisted in 1785 of 4 Parnasim and a gabbai. The ex-members of the Mahamad were called "Adjunctos". They, and the College of the Mahamad, made-up the "Juncta," the governing board. The Mahamad acted also as their Court of Civil Justice. In the "Ashkamoth" (rules of the Congregation) of 1748 it was written that the assembly of the Senhores do Mahamad "como deputados" had the right of civil justice. In light of their importance to the general community Jewish settlers had previously been guaranteed (1665) full enjoyment and free exercise of their religious rites and usages, a guarantee which was reinforced in 1667 when it was decreed that all Jews who came to Suriname for settlement purposes were to be considered British-born subjects. When Suriname surrendered to the Dutch in 1667, some of the colonists left, but not without opposition on the part of the Dutch authorities. Under Dutch occupation, Spanish and Portuguese Jews came from Amsterdam. The Jewish community continued to prosper under the Dutch, owning numerous slaves and plantations. Nevertheless, a number of the settlers tried to leave in 1674 but were forcibly held back by the Dutch. Two years later, the Jews were promised free exercise of their religion, having been restricted by the Dutch after their occupation of Suriname in 1667. By 1694, there were 92 Portuguese Jewish families and some 12 German Jewish ones in the colony, totaling 570 persons who had holdings of more than 40 plantations and 9,000 slaves. The economic position of the community rose rapidly during the first half of the 17th century. Yet, the end of the 17th century and the beginning of the 18th century brought many problems between the Suriname Jews and the Dutch Government. Their privileges of 1665 and 1667, such as contract marriages, opening their shops on Sunday, and administering justice, were criticized. In 1767, hostilities culminated in considering creating a ghetto for the Jews in Paramaribo. Jews owned 115 of 400 plantations in 1730; however, their position declined, and by 1791 they owned only 46 of 600 plantations. Anti-Jewish feelings grew slowly in the colony, which led to various efforts on the part of the Dutch to restrict the religious freedom of the Jews beginning in 1667. Furthermore, differences arose between the Portuguese and German Jewish communities, eventually resulting in a division of the community and the formation of the Neve Shalom Ashkenazi synagogue. The synagogue Neve Shalom (Oasis of Peace), built in 1719 (enlarged in 1780 to 200 seats for males and rebuilt from 1833 to 1835, having been destroyed by a fire) in Paramaribo was sold to the Ashkenazim in 1735. In the same year the Sephardim started to build their own synagogue in Paramaribo called Sedek Ve Shalom (Justice and Peace). Suriname was attacked by the French under the command of Du Casse in 1689 and under the command of Cassard in 1712, who looted the colony and also inflicted much harm to the Jewish planters. Yet, the German community continued to grow throughout the 18th and 19th centuries, and by 1836 it was larger than the Portuguese one. In 1825, all special privileges which had previously been granted to the community were no longer necessary, since they enjoyed full and equal rights as subjects of the crown. Dutch gradually replaced Portuguese as the language of the community. The economic decline of the community was largely connected with the abolition of the slave trade in 1819 and the emancipation of the slaves in 1863. As the export of sugarcane dropped off during the 19th century, the inhabitants made efforts to adapt the soil to other uses; as their efforts failed, they moved largely to the coastal areas. In 1861 the archives of the former Jewish court at Jodensavanne were declared government property and put in the Suriname library, later transferred to The Hague in 1916. The Jewish population was estimated at 719 in 1835, dropping steadily to 607 in 1885. As the Jewish population declined during the first quarter of the 20th century, the economic situation of the colony forced what was left of a thriving Jewish community to relocate itself mainly in Paramaribo, the capital. During World War II, a few Jewish refugees from the Netherlands and other parts of Europe settled temporarily in Suriname. By 1970, there were only about 500 people left in the community, which held alternating services at the synagogues of Congregations Neve Shalom and Zedek ve-Shalom, the congregations of the Ashkenazi and Sephardi communities respectively. 200 Jews live in Suriname with the Nederlands Portugees Israelitische Gemeente overseeing the community's activities. 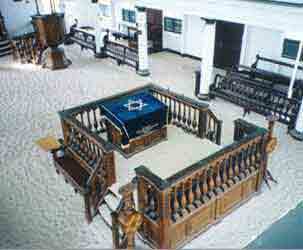 The two 18th century synagogues in the capital, Paramaribo, have been restored. Neve Shalom is considered to be Conservative, and both synagogues hold weekly Shabbat services. The Ashkenazi synagogue, like the Curacao one, has a sandy floor, which is symbolic of the 40 years in the desert, and was also supposed to have hidden the foot steps of the Conversos. Kosher food is available. There is a community newspaper, Sim Shalom, that is printed in Dutch. Israel and Suriname have enjoyed full diplomatic relations since the country attained independence in 1975. Israel is represented by its ambassador in Caracas and by an honorary consul in Paramaribo. Beker, Avi. "Suriname." Jewish Communities of the World. Lerner Publications Company, Minneapolis, 1998. Zaidner, Michael. Jewish Travel Guide 2000. Vallentine Mitchell, Portland, OR, 2000.